I’ve not featured many of the interior rooms of Le Lac Des Cygnes since its completion. Hopefully, this will be the first of many interior shots of the Chateau. Between Christmas and New Years while taking a break from blogging I decided to revisit a few sentimental favorite designers to see what they were creating. One of my stops was at Tres Beau and was pleasantly surprised to find an array of home and garden items and wedding venue decor. 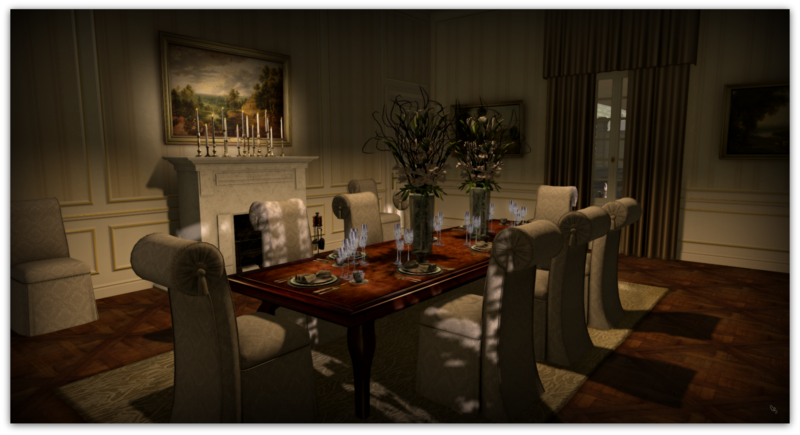 The slipper chairs, table service, and floral arrangements are from Kimmera’s collections and all have texture changeability. The degree of formality is just about perfect for the Chateau.